So, Missy and I are going to try to raise vegetables this summer. However, we’ve got kind of a tough yard – mostly shaded, pretty rocky. The only real flat spot has the boy’s playscape on it, though once they get a bit older, I think we’re having a bonfire and converting it to a garden. 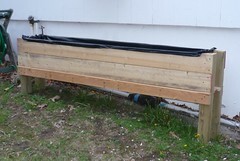 I designed them to use standard 8′ lengths of lumber without much waste. 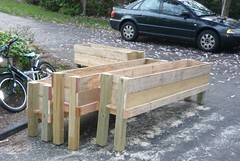 The planting portion of each box is 7’x1’x1′, which let me use standard 8′ lengths of lumber. The sides are 1/2″x6″ roughcut from a local lumber store that sells them cheap in 16′ lengths. I cut a foot off of each board, and used that to make the ends of the boxes. I also cut a 2″x4″ into 1′ lengths and used that, with another 2×4 on each side, to brace the bottom of the boxes. Each box has a 4×4 at the corner, cut to fit a slope. I’m lining them with 5 mil plastic with some drainage through holes in the boards, and once they’re full of dirt, we’ll put in a soaker hose for watering. Missy started seeds this weekend, and I’ve got another 4 or so boxes to build. I think I’ll do an Instructable about putting the boxes together when I do the rest of them. Until then, it’s store-bought fresh veg.